In an earlier post, I mentioned remembrances, say, for those (plenty of them) who did not have descendants; we ought to remember them. Examples could be Joseph and Ann and John Tylly. Also, we did an incomplete roll-call of lost whaling Gardners in a Beacon (Vol. II, No. 2) issue. Recently, while researching the ancestry of Dr. Frank A. and looking at tie-ins to Rev. Francis Dane, I ran across some others who ought to be remembered, namely children who never got a chance. We can consider this group by using Dr. Frank (first cousin)'s paternal grandmother who is mentioned in his 1907 book on page 285. She was Lucy Foster Wilson who married Benjamin Brown Gardner. In the below, we will look at the family of Lucy's great-grandfather. He was John (2) Wilson who married Hannah Frye in Andover, MA on 25 Mar 1742. The significance of choosing John (the different Johns are marked, as needed) and Hannah will be explained below. First, though, let's talk about John's mother. She was Mercy/Marcy Wright who married John (1) Wilson in Andover on 21 Jun 1716. This is after the Salem ordeals. And, John, born 1682, would have been there; Mercy's parents were married in 1697, so she was not yet born. Both her mother, Mercy (Wardwell) Wright, and her grandmother, Sarah (Hooper)(Hawkes) Wardwell were accused. Her grandfather, Samuel Wardwell, was hanged on 22 Sep 1692. "Is that not affliction enough? ", one might ask. Well, let's consider Mercy Wright's husband, John (1). His mother was Sarah (Lord) Wilson who had been accused. Too, Sarah's daughter, John's sister, was accused. Mind you, "accused" seems like a cute word, but we have to really understand the treatment that these accused experienced. For all of the above, that ordeal was not a gentle recline in a country club. Rather, we ought to use tormented. Now, before we get to the kids, we can look at John's (2) wife, Hannah. Her great-grandmother was Mary (Ayer Parker). Too, her [great] aunt was Sarah Parker. Both were accused. However, Mary, as an older widow, was hanged (same date as Samuel, above). Again, that is a large cluster there in Andover of related persons (not all are listed in this post) who were being troubled by the time. And, coming forward, Lucy has other associations, including Dane (so there are links to the extended family of Rev. Francis). Let's consider the image on the right. It is from the collection from the vital records of Andover and lists deaths. The arrows are explained below. I ran across these pages while getting the details about the children of John (1) and Mercy. Of course, vital records also have the births pages. Essentially, one can find a dozen children listed as being born to this couple. Too, one wants to look at marriages (if any) and deaths. What stood out was that most of the children of John and Mercy are listed as having died early. "Why?" comes to mind, immediately. Before looking at that, notice how there are notations (lines with the arrows) that say at what age the children died: 17, 15, 13, 10, 7, 6, 4, 2. And, these deaths were all in November of 1738 (reason for the arrows). How awful it must have been for John and Mercy. 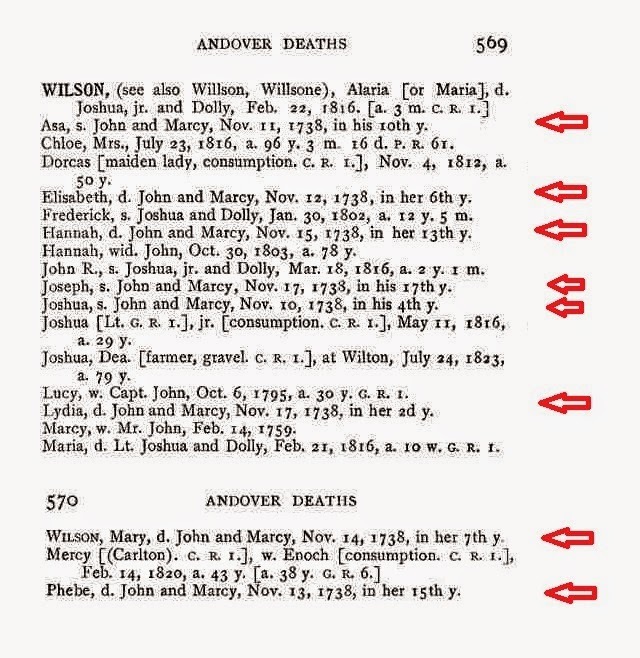 Aside: Some births and deaths, for John's and Mercy's kids, were listed under the spelling of Willson (John and Mercy had other children who died in their early years). So, ought we not consider the couple's ordeal in losing so many children in one month? Too, out of their children, only two survived to adulthood and were married. Their oldest daughter had two children of her own, but both of them died young, as did she, at childbirth of her second. That left one child, John (2), who had several children, giving John (1) and Mercy grandchildren, one of whom, Joshua, was the ancestor of Lucy Foster Wilson. What happened to the Wilson children? Of the many epidemics that ran through New England, one occurred from 1735-1740. The peak for this particular plague was 1738. There was one estimate that 1400 children died in Essex County during this period. One year had more deaths of children recorded than births. Our interests include colonial medicine, so we intend to get more information about this time of terror that came for John (1) and Mercy right after the idiocy of the 1692 era. In brief, there was an outbreak of Small Pox, Scarlet Fever, and Diptheria (full text of Caulfield's paper - PDF is available) that devastated the population. Unfortunately, the couple who lost so many children had already gone through another ordeal which seems to have been romanticized. So, we need to pull together a list of the names of these kids who died early, as we can, so that they are not forgotten. 04/30/2014 - Changed marriage date and verbiage for John Wilson and Mercy Wright. The date that had been typed above was for the marriage of Mercy's parents (John Wright and Mercy Wardwell - 1697 - five years after Mercy Wardwell's father had been hanged). -- Moral: There are multiple hats with publication, at least two: writer and editor. But, there needs to be fact checker, too, whose task would be to verify that things, like numbers and dates, were transferred properly. However, no mea culpa, as I saw one of these the other day in a highly-exclaimed, academic publication. I had thought to point the error out, but who is perfect? Obviously, no one who blogs. The key is to have the discipline to make sure that the hatted roles were actually done. 05/02/2014 -- More Andover perspective. 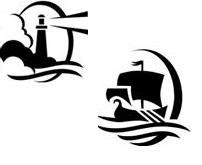 05/26/2014 -- An article titled "The Trials of the Wilson Family" due to be published in The Essex Genealogist in the August edition (includes a four page Ahnentafel starting with Dr. Frank A. 's grandmother, Lucy Foster Wilson). 09/01/2014 -- Gardner Research announced. "The Trials of the Wilson Family" published (TEG (2014) 34:155). 06/05/2015 -- Of course, the subject related to these themes will have recurrent attention. Haverhill, the next town over (northeast), had many deaths during the epidemic. ... The Wilson family were ancestors of Lucy Foster Wilson, paternal grandmother of Dr. Frank A. Gardner (the author). 03/02/2019 -- We building an index by images for our portal to truth.